Ivory Snow is laundry detergent to wash baby clothes. This is a hidden coupon which can be found if you click on the Pampers Brandsaver link at the bottom of Pampers Canada’s website. You must select at least 4 coupons before Brandsaver will mail the coupons, and it will take about 3-4 weeks before they arrive. 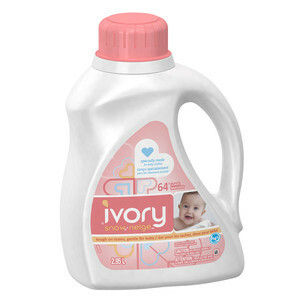 Ivory Snow coupon is to Save $1 when you buy any Ivory Snow Laundry detergent product. For 60 years, Ivory Snow has been trusted by moms and is the leading baby laundry detergent in Canada. Specially formulated to rinse thoroughly with each eash, Ivory Snow leaves virtually no residue on baby’s clothes. It does not contain harsh chemicals. No wonder Ivory Snow has also been the choice ofnew parents for years.